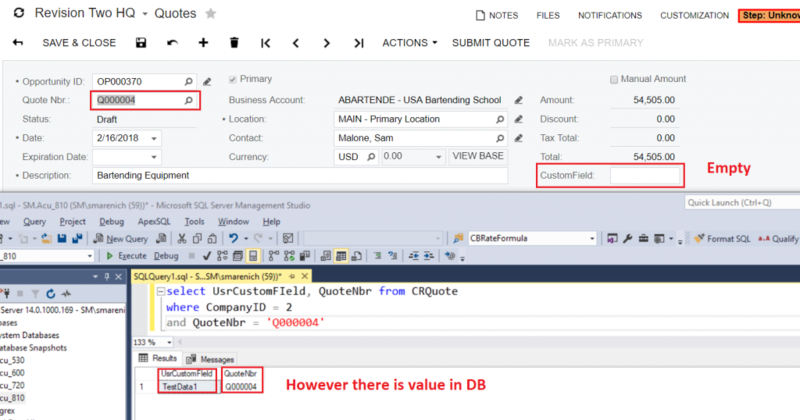 If you try to add a custom field on CR Quotes in Acumatica 2018 R2 you may face very weird behavior – field is added, can be saved to database but as soon as you refresh screen or record valued disappears. And to correctly work, custom field needs to be added in both of the places. 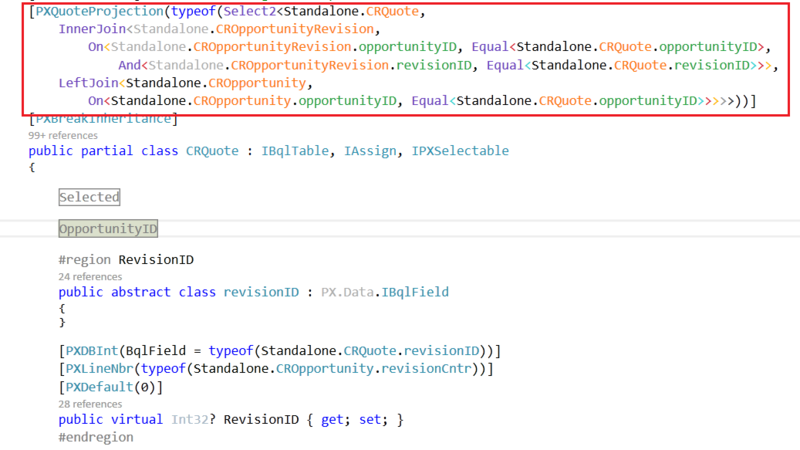 And Projection field should be linked to table field using BqlField property of DBFieldAttributes. Unfortunately customization by default adds new field only to projection dac and not tho the real one. Now your field will be automatically selected from the DB. I have a question that may be related to this one. I’m trying to add a custom field on both Location screen and Customer screen similar to the native fields provided by Acumatica (ex: Tax Registration ID, Tax Zone). These fields can be viewed/edited from either the Customers screen or the Locations screen. I think it may have something to CR.Standalone.Location DAC similar to what you’ve described here for CR.Standalone.CRQuote. But so far, I’ve not been able to figure out how to make it work. Location and address are different tables and they are not inherited from each other. So if you add field to location it can’t be used from address. There is a projection table that combines location and address – LocationExtAddress. In this case it will be related, but as far as I can see from your screenshot – you have just normal tables. What is the problem if you add field just on location? is that not shown?